Club de Fútbol Monterrey is a Mexican football club from Monterrey, Nuevo León which currently plays in the Liga MX. Founded on 28 June 1945, it is the oldest active team in the professional division from the northern part of Mexico yet the institution with the least Liga MX titles. The club is owned by FEMSA, Latin America's largest bottling company. Its home games have been played in the Estadio BBVA Bancomer since 2015. Monterrey has won 3 league titles, two domestic cups, and three CONCACAF Champions League titles (notably, three consecutive tournaments in 2011, 2012 and 2013). The team is commonly known as the Rayados (the striped ones), due to the club's traditional navy blue striped uniform. The uniform is reflected in the club's current crest, which is also decorated with stars above the crest representing the club's league titles and stars below the crest representing continental titles. The club's oldest rival is Tigres UANL of the Autonomous University of Nuevo León. The local derby, known as the Clásico Regiomontano, is known for being one of the most intensely competed derbies in Mexican football and is regarded by people in the city of Monterrey as the most important Mexican derby. Club de Fútbol Monterrey was founded on the 28th of June 1945, near the end of World War II by a group of industrial businessmen headed by Ramón Cárdenas Coronado, Enrique Ayala Medina, Paul C. Probert, Rogelio Cantú Gómez and Miguel Margáín Zozaya. The team's nickname was popularly accepted, after the team's uniform, which is traditionally white with navy blue vertical stripes. Although the original uniform was white with a diagonal blue upper shoulder, the stripes were inspired in 1965, when the Tampico Madero (nicknamed "Jaibas Bravas", or Brave crabs) football team wore them, and the Monterrey team adopted them. Since, the home uniform consists of vertical blue and white striped jerseys with blue shorts. In its first professional game, played 19 August 1945 against San Sebastián de León, Monterrey won 1–0, with José "Che" Gómez scoring the winner. That joy quickly came to an end, first by losing 6–0 to Montezuma, and then having the club's travelling bus involved in a tragic accident in the San Juan de los Lagos roads that would take the lives of many of the club's players and had a big impact on the surviving players. The other Mexican clubs in solidarity loaned players to Monterrey in order to continue playing the tournament, but the club struggled nevertheless losing 21 games in a row and allowing in 121 goals that year, finishing last in the league. Due to these events, the club decided to stop playing in the league in 1946 in honor to the players who died. It was not until 1952 when the club resumed action thanks to Dr. Carlos Canseco, president of the Asociación de Fútbol de Nuevo León. The club enrolled in the second division and just 4 years later the club earned a promotion to the top division. Once again the joy was short-lived, when the club finished last in their first year back and was relegated once again to the second division after finishing with a record of 4 wins, 7 draws and 13 losses for a total of 15 points, just 1 short of Zacatepec who kept the category. The club would once again earn the promotion in the 1959–60 tournament which they have held to date. The club started off the 1960s in bad shape just avoiding relegation with 3 more points than Club Celaya. The club finished the 1960–61 tournament with a record of 7 wins 7 draws 12 losses for a total of 21 points. 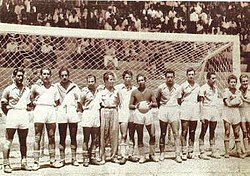 In the 1961–62 tournament the club was again close to relegation finishing 2nd last for the second year in a row just ahead of Zacatepec, who would now be relegated. The club had a record of 7 wins 5 draws and 15 losses for a total of 19 points. In the 1962–63 tournament the club finally managed to have a successful year in the first division finishing 5th in the league, 2 points behind CD Oro, that year's champions who finished with a league best 36 points. That year's record was 8 wins 12 draws and only 6 losses for a total of 28 points. In the 1963–64 tournament the club would finish 3rd in the league just 5 points behind club Guadalajara who would have a league best 37 points. That year record was 12 wins 8 draws 6 losses for a total of 32 points. In the 1964–65 tournament the club would once again finish 3rd in the league this time just 3 points behind club Guadalajara who won its second consecutive league title with 40 points. This year's record was 17 wins 3 draws and 10 losses for a total of 37 points. In the 1965–66 tournament the club finished tied for 4th in the league with Club Atlante with 33 points. This year is also remember for Club Nuevo León promotion to the first division having for the first time 2 clubs from Monterrey participating in the first division. This year record was 13 wins 7 draws and 10 losses for a total of 33 points. In the 1966–67 tournament the club felt back into mediocrity finishing tied for 8th in the league with Irapuato with 30 points each. This year record was 10 wins, draws and losses for a total of 30 points. In the 1967–68 tournament the club continue its descent finishing tied for 14 in the league with CD Oro. That year record was 6 wins 9 draws and 15 losses for a total of 21 points. In the 1968–69 tournament the club finished tied for 10th place in the league with Pachuca. This year is also remembered for Club Nuevo León's relegation after the club finished tied for last place with CD Oro both with 21 points. A playoff series was held where after 3 matches CD Oro managed to maintain its category. This year record was 10 wins 8 draws and 12 losses for a total of 28 points. In the 1969–70 tournament the club close this decade tied for 9th place along with Atlante both with 28 points. This year record was 9 wins 10 draws and 11 losses for a total of 2 points. The 1960s saw the club fight for the title as well to maintain the category. In the 1970s the tournament was split into 2 short tournaments, due to the 1970 world cup that was taking part in Mexico for the first time. The club was placed in group 1 where they managed to finish 2nd with 17 points, 1 less than group leader Toluca. In the second part of the tournament the club finished 7th. The following year Monterrey finished runner up to Club América who went on to win the league title that year against Toluca. In the 1971–72 tournament the club qualified for the play-offs which had been introduced a few years back. The club would lose in quarterfinals to Club América 2–1 i On aggregate. The following year the club failed to qualify finishing tie for 5th with Veracruz and Guadalajara each with 32 points. In the 1973–74 tournament the club managed to qualify for the quarterfinals where they once again were eliminated this time by Atlético Español who beat them 5–6 on aggregate. The following year the club failed to qualify for the playoffs, finishing 3rd in group 2 with a record of 15 wins 14 draws losing 9 for a total of 44 points, 2 points fewer than Unión de Curtidores who qualified. In the 1975–76 tournament the club finished in first place with a total of 44 points by means of 16 wins, 12 draws and 10 losses. In quarterfinals the club played Cruz Azul who they managed to beat 7–2 on aggregate, scoring 5 goals in the first match and 2 more in the second winning both games. In semifinals the club played Guadalajara who eliminated them with a score of 2–3 on aggregate. During 1975, the Portuguese superstar Eusébio played for the club. For the 1976–77 tournament, the club failed to qualify finishing 4th in group 2 with 32 points by means of 10 wins, 12 draws losing 16 games. For the 1977–78 tournament the club once again fell short and did not qualify finishing 4th in group 2 with 38 points just 6 shy of cross town rival Tigres UANL, who won its first league title. In the 1978–79 tournament the club once again qualified to the playoffs finishing 1st in group one with a total of 40 points by means of 14 wins 12 draws losing 12. This time a short tournament was played by the best 8 teams in the league who were then split into 2 groups. Monterrey was placed in group 2 along with Pumas UNAM, Tigres UANL and Zacatepec. after 6 rounds of play the club finished in 3rd place with 6 points by means of 1 win, 4 draws losing just 1 match, just 2 points behind Pumas UNAM who went on to lose to Cruz Azul who had won the other group. In the 1979–80 tournament the club finished 3rd in group 1 with 34 points with a record of 9 wins 16 draws losing 16 games scoring 40 goals and allowing 50. The decade came to an end with Club Monterrey having title to show for all their efforts, qualifying a couple times but failing to win their first league title. Club celebrating their first league title in 1986. 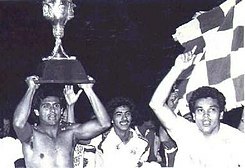 On 1 March 1986, the Rayados won their first league title in the return leg of a series against Tampico-Madero in the Estadio Tecnológico during the Torneo México 86, winning by an aggregate 3–2 score. The goals were scored by Brazilian Reinaldo Güeldini, who scored from a penalty after Mario Bahia was fouled, and Mexican 20 year-old Francisco Javier "El Abuelo" Cruz, who finished the season as the league leader in goals. For many years, the team's logo did not show the star of the first league title, up until 2001. The next season, the team signed several players, including Brazilian midfielder Ricardo Ferretti, but the team had an inconsistent season and would finish the remaining years of the decade without lifting a trophy. At the beginning of the decade, Monterrey signed two notable players, Carlos Hermosillo and Manuel Negrete, for the 1990–91 season. The next season, they won their first Copa MX after defeating CD Juarez 4–2 at home in the Estadio Tecnologico and then went on to reach the league final of the 1992–93 season, losing to Atlante FC. While the early years of the decade seemed promising for Monterrey, the latter half of the decade would prove to be a disappointing one, as financial problems started to become a problem for the club. During this period, the club sold many players who would go on to have successful careers with other teams like Ramon Morales and Sinha. Young talent Jesus Arellano was sold to Guadalajara in 1997, though he returned to the club in 2000 and spent the next eleven years as captain before retiring in 2011. One of the most memorable moments of this decade was the so-called Clasico del Descenso. In March 1996, Monterrey defeated their arch-rivals Tigres UANL, who were facing a relegation battle after years of poor results. The defeat meant that Tigres would be relegated for the first and so far only time in their history to the Segunda División. In 1999, Monterrey was facing a fierce relegation battle of its own against Puebla, culminating on May 9, 1999, when the teams faced each other at the Estadio Tecnologico to decide which team would get relegated. Monterrey only needed a draw to stay in the Primera Division, and with a memorable performance from Francisco Javier "El Abuelo" Cruz who had played a vital role in Monterrey's first title win thirteen years before, Monterrey managed to draw 1–1 and stay in the Mexican Primera Division. Guillermo Franco (pictured in 2010) played a vital role in the club's Clausura 2003 title win. In 2002, Monterrey hired coach Daniel Pasarella and started to form a strong and competitive side featuring the likes of Guillermo Franco, Walter Erviti, Jesus Arellano and Luis Perez. In the Clausura 2003 tournament, they won their second title. In the semi-finals, they faced their arch-rivals Tigres for the first time ever in a Liguilla. In the first leg, they won 4–1 at the Estadio Universitario, and despite losing 2–1 at their home ground in the second leg, they managed to advance to the finals with an aggregate victory of 5–3. On June 14, 2003, they defeated Monarcas Morelia by an aggregate of 3–1 to claim their second league title after 17 years. Pasarella left in 2004, and afterwards, Monterrey hired Miguel Herrera to be their head coach. 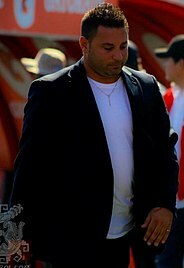 He led them to the finals of the Apertura 2004, but the club lost against Club Universidad Nacional by an aggregate of 3–1. He would lead them to the finals again in the Apertura 2005 tournament, this time losing to Deportivo Toluca F.C. by an aggregate of 6–3. After the loss, Guillermo Franco left the club to play for Spanish club Villarreal CF. Herrera would remain their head coach until 2007, when he was fired after a poor string of results in the Apertura 2007. For the Clausura 2008, Monterrey hired Ricardo La Volpe to be their head coach, and they managed to reach the semi-finals. This team featured new players such as Humberto Suazo and newly acquired league veteran striker Jared Borgetti. However, the next tournament was a poor one for Rayados, as they finished in 14th place. In 2009, Monterrey hired coach Victor Manuel Vucetich and formed a team that would become one of the strongest in the league, with an attack led by Humberto Suazo and new acquisition Aldo de Nigris, a midfield featuring veteran players Luis Ernesto Perez and Jesus Arellano along with Walter Ayovi and a defence led by Jose Maria Basanta, Duilio Davino and goalkeeper Jonathan Orozco. They won their third league title, the Apertura 2009 tournament, with an aggregate victory of 6–4 against Cruz Azul in the finals. The first leg was played at the Estadio Tecnologico, where Monterrey overcame a 3–1 deficit to win the game 4–3. 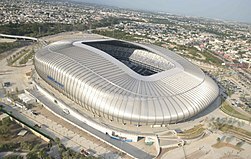 The second leg was played at the Estadio Azul, with Monterrey winning 2–1. Thus, after a six-year wait Monterrey lifted their third league title. In the next tournament, Humberto Suazo left to play for Spanish club Real Zaragoza, but nonetheless, Monterrey managed to finish on top of the table for the first time in their history. However, they would be eliminated in the quarter-finals by Pachuca. 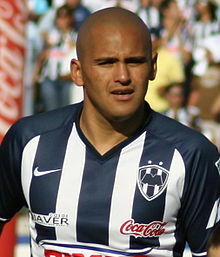 Suazo returned to Rayados for the Apertura 2010 tournament, and they managed to win their fourth league title when they defeated Santos Laguna in the finals. Although they lost 3–2 in the first leg, they were able to make a comeback and win 3–0 in the second leg at the Estadio Tecnologico, with Humberto Suazo and Jose Basanta scoring two and one goals, respectively. With an aggregate score of 5–3, Monterrey claimed their fourth title. Monterrey secured a place in the 2010-11 CONCACAF Champions League and won the tournament for the first time in their history. They faced Real Salt Lake in the Finals and won 3–2 on aggregate to claim their first CONCACAF Champions League title and the third title in the Vucetich Era. The following year, they reached the finals of the Clausura 2012 league tournament and the 2011-12 CONCACAF Champions League. Both finals were against the same opponent, Santos Laguna. Rayados were seeking to win their fifth league title and their second Champions League title. They lost the Clausura 2012 finals against Santos Laguna but won the finals of the Champions League against Santos with an aggregate of 3–2 to claim their second consecutive CONCACAF title. Monterrey reached the finals of the 2012-13 CONCACAF Champions League for the third consecutive time. They faced Santos Laguna in a repeat of the previous year's final. They drew 0–0 in the first leg. In the second leg, Santos built a 2–0 lead with goals from Darwin Quintero and former Rayados player Felipe Baloy. However, Monterrey managed to make a dramatic comeback and scored four goals, with a brace from Aldo de Nigris and a goal each from Humberto Suazo and Neri Cardozo. Monterrey won their third consecutive CONCACAF Champions League title and the fifth overall title in the Vucetich Era. This solidified them as the best Mexican soccer team of all time. Although they enjoyed tremendous success in the CONCACAF Champions League, they did not return to the following tournament as they could not reach any league finals during the 2012–13 Liga MX season and thus could not get a chance to try and become the first team to win the tournament four times in a row. Monterrey started the 2013–14 season with a lot of changes. Aldo de Nigris left the club to join Chivas, and Walter Ayovi joined Pachuca. By now, players like Jesus Arellano and Duilio Davino had retired, and long-time club players like Luis Ernesto Perez had left the club. With the arrival of new players like Dorlan Pabon and Leobardo Lopez, Monterrey was ready for the Apertura 2013 tournament. However, a string of poor results and the shock early departure of Pabon would prove to be a threat as Monterrey started the tournament poorly. On August 25, 2013, Rayados announced that Vucetich had stepped down as coach, and thus the Vucetich Era, which earned the club a total of five titles in four years, came to an end. Humberto Suazo is the club's all-time top scorer with 121 goals across all competitions. 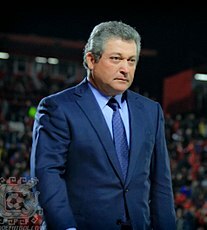 Rayados hired Jose Guadalupe Cruz to become the new manager of the team, and although they managed to reach the semi-finals of the domestic cup, the Copa MX, they failed to qualify to the playoffs of the Apertura 2013 tournament. After a bad start to the Clausura 2014, they fired Cruz on February 18, 2014, after only 17 league games coached. Monterrey replaced Cruz with Carlos Barra, who had worked as an assistant coach for Vucetich. Although they failed to reach the playoffs for the second consecutive tournament, the team kept Barra for the 2014–15 season. Colombian striker Dorlan Pabon re-joined the team, and with new signings such as Stefan Medina and Pablo Barrera, Monterrey started the Apertura 2014 tournament with high expectations. They managed to secure 6th place and returned to the playoffs for the first time since Vucetich had managed the club. The club had a strike partnership of Dorlan Pabon and Humberto Suazo, with Pabon scoring 11 goals. The club reached the semi-finals but lost 3–0 on aggregate against the eventual champions Club America in what would prove to be Suazo's last games with the club before returning to Colo-Colo. Suazo had scored over 102 league goals in a seven-year span and became the all-time top scorer for the club. The team started the Clausura 2015 tournament in poor form, losing four of their first six games, and on February 15, the team fired Barra and replaced him with two-time Liga MX champion Antonio Mohamed, who had led Club America to the league championship the previous tournament. Mohamed had played for Rayados during his years as a player. He was part of the squad that managed to avoid relegation in 1999. Monterrey did not qualify to the playoffs under Mohamed, but the club were keen on keeping him for the 2015–16 season. That season would prove to be a special one as the team were moving to a new home ground, the Estadio BBVA Bancomer. In the summer, Rayados made new signings, including midfielder Walter Gargano, striker Rogelio Funes Mori and re-signed Jose Maria Basanta, who had left for Italian side Florentina after the 2014 FIFA World Cup. Former club veterans Aldo de Nigris and Luis Ernesto Perez also returned to the club, along with the promotion to the first team of promising young center back Cesar Montes. Rayados had a formidable attacking trio of Dorlan Pabon, Rogelio Funes Mori and Edwin Cardona, who had signed with Monterrey during the winter of 2015. They narrowly missed the playoffs of the Apertura 2015 tournament, but their offense was lauded by many as one of the best in the league. After failing to qualify for the playoffs in 2015, the club loaned several players to other clubs in the league. Players such as Stefan Medina and Severo Meza were loaned to Pachuca and Sinaloa, respectively. In the winter of 2016, the team acquired club veteran Walter Ayovi who had left the club in 2013 and River Plate midfielder Carlos Sánchez who had won the Copa Libertadores a few months prior. The team began the Clausura 2016 tournament in great form by winning their first three games. They went on to have their best regular season in years by finishing on top of the league with 37 points, seven points ahead of second place Pachuca. The team's success was primarily due to their attacking trio composed of Pabon, Funes Mori and Cardona, with midfielder Carlos Sanchez providing several goals and assists. The team entered the playoffs as favourites to win the title. In the quarterfinals, they faced their arch-rivals and defending league champions Tigres UANL, the first leg was played at the Estadio Universitario where Monterrey won 3–1. The away leg was played at the BBVA Bancomer, where Tigres won 2–1 despite several penalties that were controversially awarded to Monterrey. Monterrey advanced to the semi-finals with a 4–3 aggregate victory and extended their record of never being eliminated by Tigres in the playoffs. In the semi-finals, they faced América, losing the first leg at the Estadio Azteca 1–0. In the second leg, they faced them at home and pulled off a dramatic 4–2 victory, in what was described by some pundits as one of the best games in the history of the playoffs. They advanced to the league finals where they would face Pachuca. Controversy arose when it was confirmed that Carlos Sanchez would not be able to play the finals as the Uruguay national team had called him up for the upcoming Copa America Centenario. In the league finals against Pachuca, Monterrey lost the first leg 1–0 at the Estadio Hidalgo, with the sole goal coming from striker Franco Jara. The second leg took place at the Estadio BBVA Bancomer in what was its first ever final since it was inaugurated the year before. On May 29, in front of 53,000 spectators, the final was played. Monterrey opened the scoring in the 39th minute with a shot from Dorlan Pabon to level the aggregate 1–1. Veteran goalkeeper Oscar Perez had several key saves for Pachuca, and in the closing minutes of the game, a header from Victor Guzman in the 93rd minute gave the title to Pachuca in what was described by the Mexican media as a heart-breaking defeat for Monterrey. The following tournament ended in disappointment as the team narrowly failed to qualify to the playoffs of the Apertura 2016. However, it also saw the return of Rayados to the CONCACAF Champions League after a three-year absence, having won the tournament three times in a row under Vucetich. The team had high hopes to redeem itself after their league title loss; however, the team was shockingly eliminated in the group stage after finishing second in their group behind Panamanian club Arabe Unido. In the Apertura 2017 season, Monterrey finished the regular season in first place with 37 points and advanced to playoffs. In quarterfinals, Monterrey beat Atlas 2-1 in the first leg and 4-1 in the second, a 6-2 aggregate. Monterrey faced Morelia in semifinals, winning 1-0 in the away leg and 4-0 in the home leg, a 5-0 aggregate. Monterrey advanced to the final against arch rival Tigres UANL. In the first leg, the teams tied 1-1 at the Estadio Universitario. In the second leg at the Estadio BBVA Bancomer, Tigres beat Monterrey 2-1 with goals from Edu Vargas and Francisco Meza. Since the club's founding in 1945, the colours used by the club have been white and blue, with varied use from the usual stripes. The shade of the blue itself has been in constant change, ranging from navy and cobalt to slightly lighter tones. The third colour has also been inconsistent, sometimes presented as being red, orange and cyan, and recently, violet, purple or green. As of July 2017, there have been a total of 112 official Clásico games, Tigres has been victorious in 40 of them, while Monterrey has won 38, and a total of 33 games have been draws. Monterrey and Tigres played their first Clásico on 13 July 1974 in the Estadio Universitario, with the match ending in a 1–1 draw. Monterrey would be the first team to win the Clásico in their second confrontation, 2–1. Almost all their first encounters were played in the Estadio Universitario, with averages of 70,000 fans attending these games, which were before the stadium renovation. In addition, there were also another six "non-official" games before the first official Clásico, in five of which Rayados were victorious. Monterrey has recently held somewhat of a regional rivalry with state neighbors Santos Laguna, whom they have played a total of four finals, with Monterrey winning three of them and Santos one. It is known by many as La Nortena. 25,000 in attendance at a Monterrey training session. Los Rayados supporters constantly fill the Estadio BBVA Bancomer. They had the highest average Liga MX attendance (50,000 per game) in 2016. The city of Monterrey claims and does have Mexico's most loyal supporting crowds for their teams, due to the city having the only venues that regularly sell-out in the Primera División. There is a rivalry between the La Adicción, a C.F. Monterrey support crowd, and the Libres y Lokos, a Tigres UANL support crowd, each time a Clásico takes place. And although the overall record is tied. Although Rayados lost the final, several fouls were controversially awarded to Tigres. Monterrey still remains at the top of the table. In 1977–78, with preparations for the 1977 CONCACAF Championship underway at the Estadio Universitario, both Tigres and Rayados played at the Estadio Tecnológico, including the first Clásico Regio derby held in the stadium; it would be the first of 42 meetings between the two clubs venue, with the final fixture being a 2–2 draw in October 2014. Monterrey won league titles in 1986 (Mexico 1986) and Apertura 2010 in the venue, as well as the Copa MX in 1991 and the CONCACAF Champions League in 2012–13. In July 2015, Monterrey moved to a new stadium called Estadio BBVA Bancomer, located in Guadalupe, Nuevo León, in Greater Monterrey. The new stadium currently has a capacity of 53,500 people. The stadium has similar features of those incorporated within the design of England's Wembley Stadium and the Aviva Stadium in Ireland. The stadium was inaugurated on 2 August 2015 in a friendly match for the eighth edition of the Eusébio Cup, where Monterrey defeated Benfica 3–0 hosting in front of a sold out crowd. The Estadio BBVA Bancomer, designed by Christopher Lee of Populous, started its development in October 2011, and included plans for reforestation and environmental healing for the decaying area that surrounds the construction site. The stadium was developed by FEMSA which costed around US $200 million. It is seen as one of the most beautiful stadiums in Mexico, it has the fourth largest capacity crowd in Mexico. It has an authentic grass surface, suites, a club-themed Restaurant, a club lounge, and high-end interior and exterior design. The inclination of the grandstand is 34 degrees and with the minimum distance allowed by FIFA to provide unsurpassed closeness to the action. On 29 May 2016, Monterrey played their first final in their new stadium in front of 50,000 fans against Pachuca for the Clausura 2016 championship, which they tied 1–1, but lost 2–1 on aggregate. The original uniform was a shirt that was split diagonally across the chest with blue and white at each side, with white shorts and navy blue socks. In 1955 after winning the second division the club used a white shirt with two horizontal blue lines across the chest. In the 1960s the club wore a different kit inspired by the one used by Jaibos Tampico Madero with vertical baby blue lines with white shorts and socks. It was in 1962 when D. José Ramón Ballina introduced the kit that the club still uses to date, inspired by Asturias FC, a club he had played in Mexico City. In the 1970s, many models emerged, some with broad, thicker stripes, and blue and black combinations, but the most significant change occurred in the mid-1980s when the color of the T-shirt changed from royal blue to navy blue, a colour that is still in use today. Atletica was the kit manufacturer from 1999 to 2007, followed by American company Nike which manufactured the kits from 2007 to 2014 afterwards Monterrey signed a contract with German sportswear manufacturer Puma which has been making the team's kit ever since. Players in bold are currently active with Club de Fútbol Monterrey. Does not count appearances in international competitions. ^ "¡Reprobado! El \'Profe\' Cruz está fuera de Rayados | FOX Sports". FOX Sports (in Spanish). Retrieved 21 June 2016. ^ Deportes, Televisa. "Humberto Suazo anuncia su salida del Monterrey". Deportes. Retrieved 22 June 2016. ^ Publisport (15 February 2015). "Llegó su hora: Carlos Barra está fuera de Rayados". Publimetro. Retrieved 22 June 2016. ^ "Oficial: Antonio Mohamed, nuevo DT de Rayados | FOX Sports". FOX Sports (in Spanish). Retrieved 22 June 2016. ^ "Tridente Rayado, de terror en la Liguilla". Medio Tiempo. Retrieved 22 June 2016. ^ "'Tridente' rayado, a punto de hacer historia". www.multimedios.com. Retrieved 22 June 2016. ^ "Rayados confirma fichaje de Carlos Sánchez" (in Spanish). 14 November 2015. Retrieved 8 June 2017. ^ "Rayados estableció récord interno de puntos". MedioTiempo (in Spanish). Retrieved 8 June 2017. ^ "Arranque histórico". www.multimedios.com. Retrieved 8 June 2017. ^ "Rayados será el favorito en Liguilla: Turco". MedioTiempo (in Spanish). Retrieved 8 June 2017. ^ "Monterrey derrota 3–1 a Tigres en juego de ida de los cuartos de final – Proceso". Proceso (in Spanish). 11 May 2016. Retrieved 8 June 2017. ^ Deportes, Televisa. "Crónica Rayados vs Tigres, Liguilla Clausura 2016". Deportes. Retrieved 8 June 2017. ^ "Queda Clásico 108 para la historia". Publimetro México (in Spanish). Retrieved 8 June 2017. ^ "América derrota 1–0 a Monterrey en ida de semifinales del Torneo de Clausura 2016 (+gol) | 24 Horas". www.24-horas.mx (in Spanish). Retrieved 8 June 2017. ^ Deportes, Televisa. "Crónica: Rayados Monterrey vs América, Semifinal Clausura 2016". Deportes. Retrieved 8 June 2017. ^ Flores, Roberto. "Rayados sufre pero vence 4–2 al América y se mete a la final". Milenio (in Spanish). Retrieved 8 June 2017. ^ Afición, La. "Carlos Sánchez no jugará la Final del Clausura 2016". Milenio (in Spanish). Retrieved 8 June 2017. ^ "Carlos Sánchez no jugará la Final del Clausura 2016". www.unotv.com. Retrieved 8 June 2017. ^ "Con gol agónico, Pachuca es campeón de Liga MX". MedioTiempo (in Spanish). Retrieved 8 June 2017. ^ Afición, La. 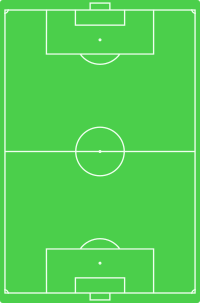 "Pachuca campéon del Clausura 2016". Milenio (in Spanish). Retrieved 8 June 2017. ^ Deportes, Azteca. "Pachuca es campeón del Clausura 2016". Azteca Deportes (in Spanish). Retrieved 8 June 2017. ^ "Triste final con sueño no cumplido | INFO7" (in Spanish). Retrieved 8 June 2017. ^ "Nuevo fracaso en la era Mohamed". www.multimedios.com. Retrieved 6 July 2017. ^ "Rayados fracasó en Concachampions; Árabe Unido lo eliminó". MedioTiempo (in Spanish). Retrieved 6 July 2017. ^ Deportes, Diego Medina / MM. "Rayados de Monterrey fracasó en Concachampions". Milenio (in Spanish). Retrieved 6 July 2017. ^ ElHorizonte. "Deja Clásico Regio un legado de pasión y duelos inolvidables – El Horizonte". elhorizonte (in Spanish). Retrieved 5 July 2017. ^ "Pasión, orgullo y mucho más..." www.multimedios.com. Retrieved 5 July 2017. ^ "Clásico regio, de más pasión que el nacional: Hugo González". MedioTiempo (in Spanish). Retrieved 5 July 2017. ^ "Eusébio Cup no México" [Eusébio Cup in Mexico] (in Portuguese). S.L. Benfica. 23 June 2015. Retrieved 23 June 2015. ^ "Rayados goleó a Benfica en inauguración" (in Spanish). Medio Tiempo. 2 August 2015. ^ "RSSSF Trofeo Ciudad de la Línea". Rec.Sport.Soccer Statistics Foundation. ^ "RSSSF Trofeo Ciudad de Alicante". Rec.Sport.Soccer Statistics Foundation. ^ "Los Angeles Nations Cup (Camel Cup) 1993". Rec.Sport.Soccer Statistics Foundation. ^ Rodríguez, Érick. "Triunfa Rayados ante texanos, país: México pdf". elnorte.com. Retrieved 2 October 2003. ^ Vargas, César. "Regios pintan bien: Anota Franco tres goles, país: México pdf". elnorte.com. Retrieved 2 August 2004. ^ "Un Vistazo, país: México pdf". elnorte.com. Retrieved 13 September 2008. ^ González, Guillermo (2009). "Monterrey pasa prueba y vence al Cracovia por dos goles a cero; gana la Mayor's Cup de Chicago". milenio.com. Retrieved 9 May 2010. ^ Garza, Jaime. "La libran en la raya, país: México pdf". elnorte.com. Retrieved 26 September 2010. ^ Guevara, Oscar (2012). "Suazo, cerca de Bahía". Retrieved 23 July 2012. Wikimedia Commons has media related to CF Monterrey. This page was last edited on 22 April 2019, at 05:46 (UTC).